Taipei, Jan. 4 (CNA) President Tsai Ing-wen (蔡英文) warned people in Taiwan on Friday to be prepared for a long battle against African swine fever (ASF) and called on China be more transparent with information on ASF outbreaks there. Tsai flew to offshore Kinmen County earlier in the day to check on quarantine measures in place after a dead hog found washed up on a county beach Monday tested positive for the ASF virus. Quarantine work should performed "as if confronted by a formidable enemy," Tsai said in Kinmen. Kinmen's two main islands are located within 10 kilometers of China's coast but nearly 200 km from Taiwan, and garbage from Xiamen often washes up on their shores. The case of the dead pig raised alarms because Taiwan is trying to keep the lethal ASF out of the country. The president visited Kinmen Shangyi Airport and Shuitou Wharf to observe measures being carried out to prevent the deadly virus from entering Taiwan's territory, including the use of sniffer dogs at immigration checkpoints to keep meat products from ASF-infected China out. While in Kinmen, Tsai urged people not to think that the ASF virus could not hit Taiwan. "If it does, it would have an extremely big impact on the industry, with losses reaching hundreds of billions of Taiwan dollars," she said. The president also warned that the anti-ASF battle could last a long time because of signs indicating that the fatal epidemic of ASF in China could become chronic. She repeated the call for China to make information on ASF outbreaks more transparent so that those on the front lines of quarantine efforts have the necessary information to do their jobs efficiently. "It's already a fact that the outbreaks are out of control," Tsai said. "I also hope the Chinese side can control the outbreaks more efficiently and make the information more transparent." To date, Taiwan has not received any information on ASF outbreaks from China as should have happened under related agreements the two sides signed in the past, Tsai said. She was referring to an agreement that allows Taiwan and China to report information relating to agricultural products and food safety to each other, but Beijing has argued it is not obliged to report ASF outbreaks to Taipei because Taiwan does not import pork from China. 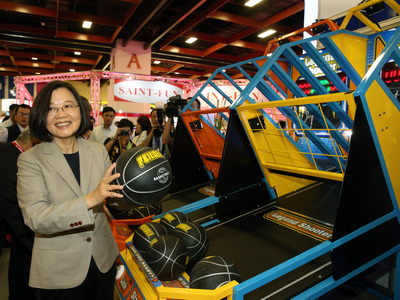 Asked about concerns that a two-week ban on the shipment of meat products from Kinmen to Taiwan proper would affect business, Tsai underlined the importance of guarding Taiwan from ASF. "No leaks are allowed," she said. To highlight the importance of a quarantine on meat products from China, Tsai wrote on her Facebook page Friday that she has signed into law an amendment to the Statute for Prevention and Control of Infectious Animal Diseases that authorizes authorities to return, confiscate or destroy international parcels containing quarantined items such as meat products from certain areas. Tsai said she received yesterday the Legislative Yuan's official report of the amendment's passage, which occurred on Dec. 28, and "I signed and promulgated it early this morning."